Another entertaining meeting of the Amateur Radio New South Wales Homebrew Group on Sunday at Dural. 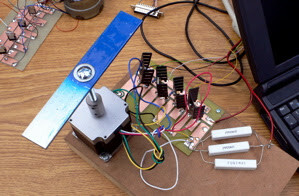 Peter O'Connell VK2EMU presented an introduction to the use of stepper motors. He explained how they work, (by stepping normally 200 little steps per revolution), how they are wired (4 wire, 5 wire, 6 wire arrangements), and how to drive them with a few darlington transistors and a PC parallel port. It will be a great loss when no computers are available with parallel ports any more but I guess the wide availability of USB chipsets will help here. A few interesting projects were discussed such as a plotter that can directly cut the copper on a circuit board to make printed circuit boards without etching, and home built milling machines for manufacturing. The great thing about stepper motors is that they are one piece of precision equipment that can be obtained free. All of those ink jet and laser printers that get left out on the curb during council junk collections contain one. Show and Tell was great too, Graham VK2GRA showed how he was using electric fence insulators for dipole construction, Stephen showed off his excellent 80m AM challenge transmitter, and Alan VK2ZAY had built a 2M AM transceiver in an Altoids tin plus a fantastic tiny short wave receiver.